Titian (Tiziano Vecellio), born in Pieve di Cadore, in the Dolomites, came under the Venetian spell through his apprenticeship with the Bellini clan and Giorgione. He swiftly rose to fame in Venice from 1520, then throughout Italy and Europe. 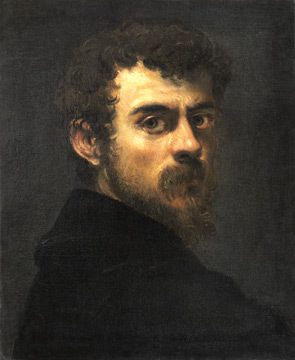 Tintoretto (Jacopo Robusti) was born in Venice around 1518. Thirty years stood between him and Titian, who was apparently his master for a while. Yet a mutual disliking seemed to take a firm hold between them, and many commissions or promises of commissions appeared as attempts to outdo or thwart the other man. 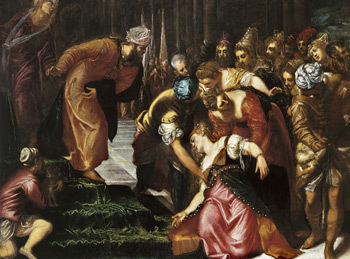 Veronese (Paolo Caliari) was born in Verona in 1528. In the 1550s he moved to Venice, where he soon received a large number of commissions from churches or the Doge’s Palace, thereby overshadowing Tintoretto. He apparently became Titian’s protégé or even a pawn in his rivalry with Tintoretto. 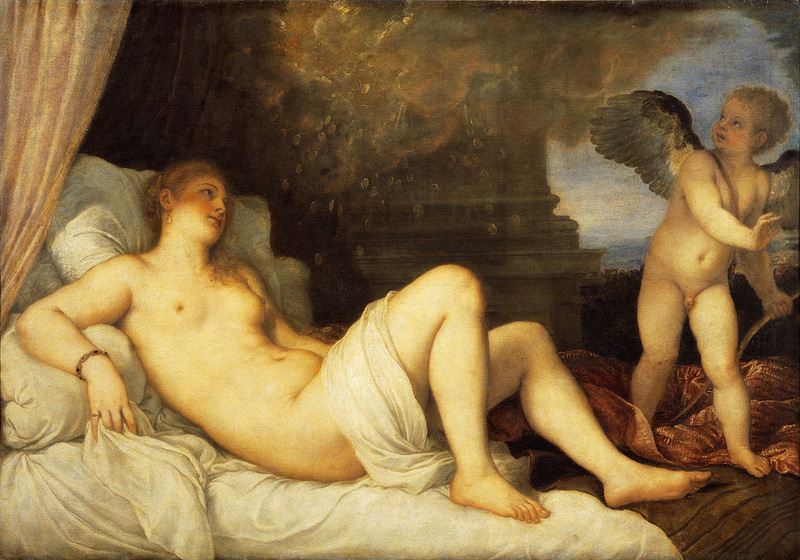 These three painters were to rub shoulders for over thirty years, and after Titian’s death in 1576, the other two would continue their mutual confrontation for another dozen years. Though rivals, they also influenced and inspired one another. For each artist, the others’ work was a stimulus that demanded a response. Their contribution to artistic revival was huge in their use of oil on canvas, their focus on “color” as opposed to “line”, and the emergence of easel painting that was to transform not only Venetian art but also the whole of European painting itself. Artistic competitiveness was not merely a Venetian phenomenon as it was already to be found a few decades earlier in Rome, Florence, and other major cities. Yet in the case of Venice, it did not lead to aesthetic degradation but rather to emulation and a profusion of ideas. Commissions from private sources, churches, and institutions, as well as from foreign clients, poured in. Venetian society did not bestow its favors upon one particular artist but maintained a sense of harmony by sharing out official commissions among an unequaled pool of painters. The paintings’ format and the fact that they were painted on canvas made them very popular and many amateurs collected their works. A host of critics would hold forth upon each artist’s latest offerings, and the general public could compare their work, talent, and progress. Various artistic contests gave a clearer picture of how rivalry among artists was a vital source of artistic revival and creation. Patrons would ask artists to design a very thorough introductory drawing (a modello) on a predetermined subject, whether for the Sala Grande of the Libreria Marciana, for the Sala dell’Albergo of the Scuola Grande di San Rocco, for the Marzeri altar in the church of San Giuliano, or for the Grand Council chamber of the Doge’s Palace; a painted modello was apparently required only in the case of the competition to design the “Paradise” fresco for the Grand Council chamber of the Doge’s Palace. This work, begun in Venice in 1544 and completed in Rome in 1545-46 for Cardinal Alessandro Farnese, enjoyed great success, even if Michelangelo lamented the fact that the composition was based on color rather than line (disegno) when he saw it; he admired the manner and color and acknowledged Titian's skill for copying life (controffare il vivo). It is said that when Titian completed this portrait, it was placed on a sunny terrace to be varnished. 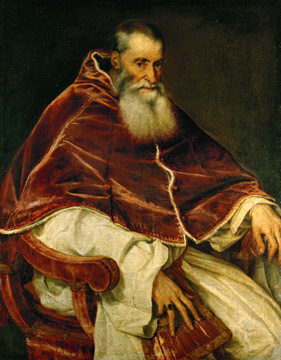 So striking was its resemblance to Pope Paul III that many would hail it, believing it to be him. While this anecdote emphasizes the illusionistic power of Titian's painting, his genius for rendering the pope's features and his talent for portraying the character in a posture of papal dignity and for depicting attire and ornament are equally at work. Tintoretto has chosen to represent one episode in the life of Esther—namely the moment when the Jewish queen goes to beseech her husband Ahasuerus to save the Jews in his empire; Esther faints and Ahasuerus, through divine intervention, rises to comfort the queen. This work is imbued with powerful dynamism and a strong sense of drama—a style that Tintoretto had just perfected and which was his hallmark. The painting unfortunately has been left unfinished (the turbaned figure on the right is just a sketch). The portrait emerges out of the darkness with its features strongly accentuated by the light. Tintoretto is a young man (between 25 and 30 years). His pose and expression reveal that he is in the process of painting himself—he is looking over his shoulder at a mirror while his right arm is outstretched toward the canvas. The full intensity and fiery ambition of this painter as described by his contemporaries are apparent here. 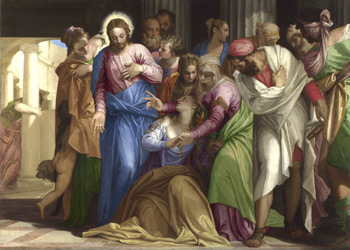 This picture painted in Verona before Veronese's arrival in Venice represents one episode in the miracles of Jesus in which a woman suffering from bleeding is healed by touching Christ's robe. All the typical features of Veronese's work are already present—a quiet confidence in the scene's orchestration; an episode suffused with light; a rich palette of hues (large flecks of pastel tones in particular); and the stability and grace of the bodily forms. 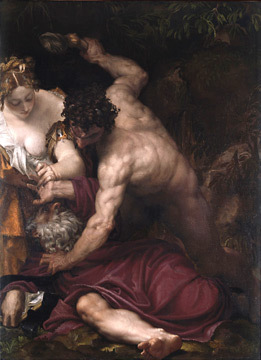 This is a unique example in Veronese's oeuvre in which he delves into dark brutality to evoke the torments of Saint Anthony. In Italian iconography, the saint is first confronted with a demon attack, followed in another scene by the temptation of the devil under the guise of a woman. Veronese combines both moments here: a male demon of statuesque musculature strikes the old man while a woman scratches him as she reveals her charms; Saint Anthony clings desperately to his prayer book. Michelangelo's influence is apparent in the rendering of the demon's physique and the composition is reminiscent of Giulio Romano.